I started last week seeing a movie with a friend about caves, and ended the week scrambling around inside caves with a totally different crowd of people. Sometimes, life just works that way, creating its own themes. Welcome to Cave Week. Watch your step! 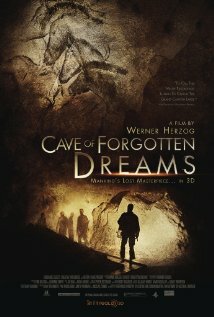 Werner Herzog's "Cave of Forgotten Dreams" is a documentary about the Chauvet caves in southern France that have drawings made 30,000 years ago. Because a cave-in sealed the entrance to the caves, the drawings look as if they were made last week, but they are, in fact, the oldest known drawings by humans. 30,000 years ago, paleolithic ancestors painted the walls with horses, lions, rhinos, bison and bears, and pressed handprints against the wall. The cave is closed to the public to protect the drawings, so Herzog's film is one of the only ways to see the ancient drawings. In keeping with Werner Herzog's weirdness factor, an intriguing part of the movie, beyond the wonder of cave paintings, was the odd characters drawn to Chauvet. One researcher's former profession? Circus performer. Another specialist dressed up in fur and played the "Star Spangled Banner" on a replica of a paleolithic flute. A perfumer sniffed near the caves and pondered what smells might have been present. The caves inspire people, but the way that inspiration manifests is decidedly individual. For me, the movie felt thin in terms of detailed information. I would have liked to hear what life might have been like for people living in the general area during the time the drawings were created. The drawings on the cave where made over a long span of time, thousands of years, so presumably there were advances in culture that may have been reflected in the layers of art in the cave. The cave was never inhabited by man however, only visited. Only the drawings lived inside full-time, a detail with seems crucial somehow, and suggests that perhaps there was a spiritual component to the area. There was mention of the deliberate placement of an animal skull, which could suggest religious significance, but of course, there is no way to know. Largely, I'm wondering about information that can't be reasonably verified. The images do stick with me, the horses' necks, the suggestion of movement, the way time slows inside that dark space, and the way scientists are trying to stop it, which seems both admirable and sad and controlling all at once. Life and art fade away no matter how much we try to keep them in place forever, no matter how much we protect and conserve. And yet there is repetition...the Chauvet horses bring to mind Picasso's horses, sketches with liveliness and movement, full of the humanness of creation. Five days later, I was suited up in an old fleece, old nylon warm-up pants from Goodwill over hiking pants, my beloved Vibram Five Fingers shoes and a miner's helmet with a groovy light and slipping into the entrance to Stillhouse Cave near Seneca Rocks, West Virginia. 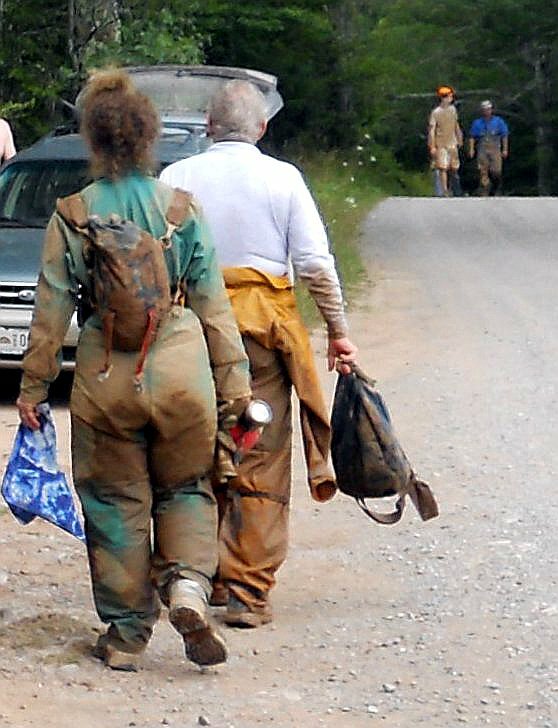 My old boss and friend Phil has been caving with crowd of folks for years, and invited me along for their latest trip. I couldn't be more grateful for such a fun introduction to friendly people and the subterranean world. Wiggling through the entrance led to a large room where we gathered to let our eyes adjust to the dark and settle into the cool. Newbies like me were directed toward the squeeze area to get a feel for sliding through tight areas and stretching for footing, climbing and clamoring through the dark. Mist hung in the air, giving the dimly lighted area the soft focus of half-remembered dreams. (Werner would relate to that sentence, I feel sure). For several hours, I scrambled in all kinds of directions, up and down, in tiny spaces and larger chambers and through one heckuva a lot of mud. I almost slid into a hole, and can thank a fellow caver and my shin for stopping my descent. The bruise is now six inches long and green. Twice, I fell hard on my rear and for once, was glad for the padding. Down mudslide creeks, I could skate on my slick shoes and on sandier shores tried to scrape some of the mud back to little success. The two Beagle-sized dogs of a fellow caver circled all around us on the trip, one eventually disappearing above ground again, but both surprisingly agile in leaping from rock to rock. Standing up at my full height became a luxury I'd never fully appreciated until spending some time wiggling along on my belly pulling myself forward with my elbows and thighs, a frog kick in the dirt. The exit of the cave, once we finally found it, was climbing up a chimney, scooting around the back of a rock and creeping up back and legs against the sides. Just as I was leaving that cave, I realized how tired my arms were from hauling myself, the shaking of fatigue not noticeable until that moment. Refreshed with a Luna bar and some chocolate and lolling in the sun, our merry band rambled down to the Sinks of Gandy cave. A much more relaxed event, the Sinks is mostly a river the runs through a hill. We sloshed through water variously ankle to thigh deep, mostly around my knees. In the dark, I saw a white crayfish, some kind of cave dwelling critter that lives its day in the dark (excepting when cavers clomp through with our headlamps). After the mud-fest of Stillhouse, we had opportunity to rinse off the heaviest layers of grime. The exit out was a good stroll up and down through boulders. We emerged to gentle, drizzly rain. I got to sit on the side of a hill above the creek a bit with cows in the pasture in the distance, and watch as folks emerged from their swims and rinse mud and splash in the water and laugh. I had a great day remembering many of the things I liked when I was a kid. Exploring, mud, water, playfulness, physical stretches just at the limit of my tippytoes, silly jokes, well-time chocolate, a helpful hand up a hill -- these are all still things that make me smile. Of course, as an adult, I ended up aching for days. I'm happy that I can once again lift my arms over my head again without whimpering. In the Sinks of Gandy cave, I left a handprint in the mud on some higher ground. I doubt Werner Herzog's descendants will be filming that handprint 30,000 years from now. Yay for caving! I love your vivid descriptions of your experience. It sounds like you had fun! You might like Jean M. Auel's latest book (prehistoric fiction), "The Land of Painted Caves." About half the book goes into imaginative detail about the reverence that the nearby people had for the caves. (The other half deals with the series arc about the Ice Age protagonist, her partner and his kin.) Auel's speculation is that people didn't live in the caves because they were spiritual places of worship, and also possibly because cave bears lived there. Thanks, Ren-Flora! I did indeed have a blast caving. Thanks for the tip on the book - I'll check it out. I imagine a large bear would diminish my interest in living in a cave too :-).